I love traveling and I feel lucky in that I get to do a fair amount with my day job. I often wonder what places and the people who lived there would look like in 1940. Vintage travel photos from 1940 are incredibly hard to come by and I feel super lucky to have recently acquired the entire 1940 collection of National Geographic magazines that have some amazing pictures and features (for £5 on Ebay UK...can you believe it?) Each month I'll try and feature a new location captured in the year 1940, and as much as possible try and match it to my work and holiday travel! For January, I thought it would be perfect to focus on one of the fashion hubs - Italy. I love Italy. The cities are beautiful, craft is still appreciated and honed, the food and wine are delicious and the fashion is admirable. 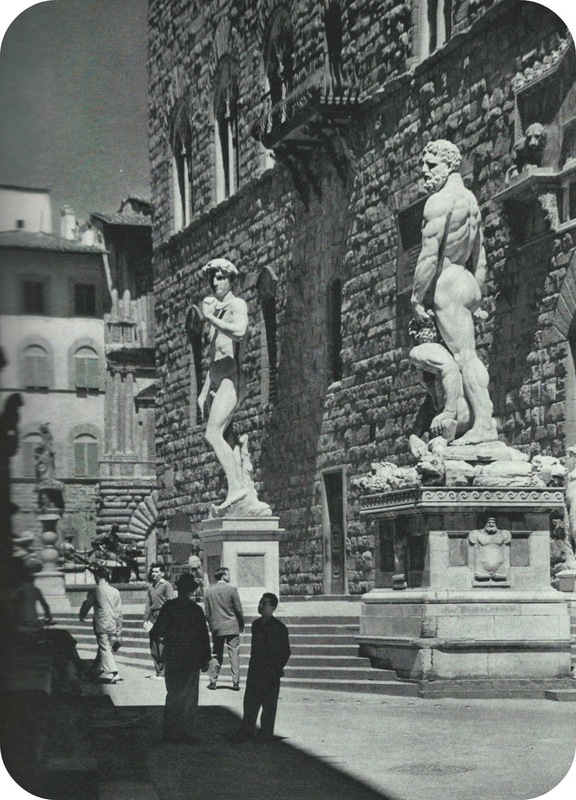 Let's take a look at a few photos from 1940 in Italy, starting with a feature in the March 1940 edition of National Geographic called "Italy, From Roman Ruins to Radio". 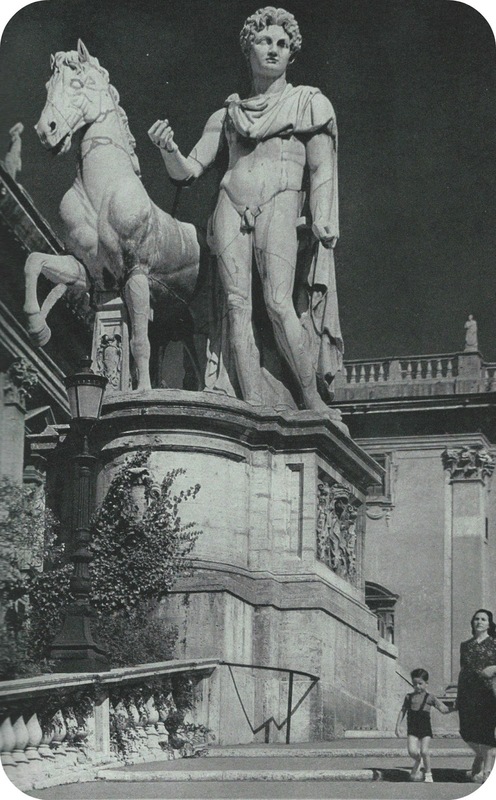 Equestrian groups of Castor and Pollux, mythical patrons of games and horsemanship, stand at the head of the broad stairs mounting the Capitoline Hill where Romulus traditionally founded Rome. Michelangelo designed the Capitoline Museum (left) and the staircase in front of the Senatorial Palace (background). A modern copy of Michelangelo's celebrated statue of the giant killers (left) replaces the original, removed for protection to the Academy of Fine Arts. Back Bandinelli, rival of the Renaissance master, carved the group at the right showing mythological Hercules, triumphant over Cacus, Vulcan's son. The fortresslike Palazzo Vecchio has served both as palace and prison; not iw contains municipal offices of Florence. Photo and caption from March 1940 National Geographic Magazine. In the same square (Piazza della Signoria), we see the group of statues with the famous Perseus at the front. This statue was completed in 1554 and has been in this square ever since. This statue was restored in 1998. 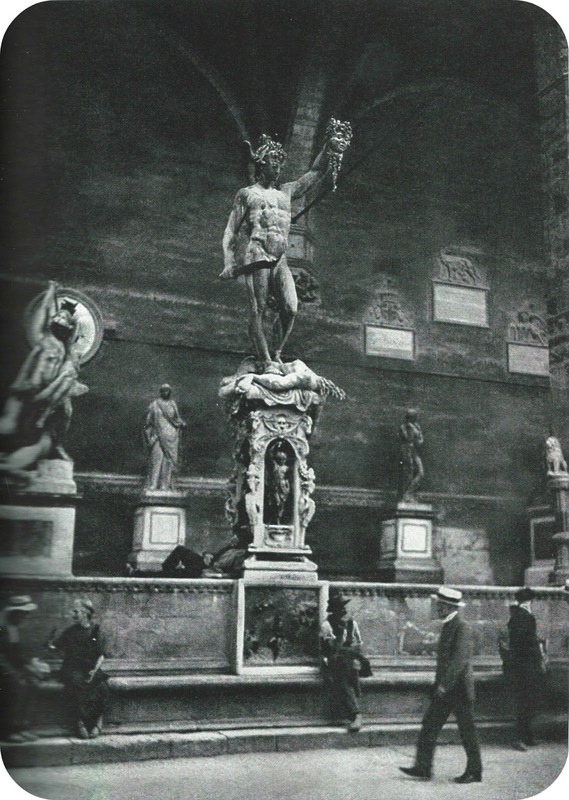 Benvenuto Cellini's bronze masterpiece and other great sculptures adorn the Loggia dei Lanzi in Florene. To cast a bronze statue, the artist first holds was in the desired form over a rough core. Then he pours on thin coats of a clay and plaster liquid which dries and makes a covering shell. The wax is melted out and the space it occupied filled with bronze. After the metal hardens, the outer case and core are removed. Photo and caption from the March 1940 National Geographic Magazine. You can't talk about the experiences of anywhere in the world during the year 1940 without talking about WWII which was well underway in Europe and Asia. This edition of National Geographic was published right as the Winter War ended, where the Soviet Union invaded Finland and a month before Germany was to invade Denmark and Norway. The photo below shows the mass crowds in Milan at a speech by Mussolini. Hitler would later visit Florence, Italy in October of 1940. 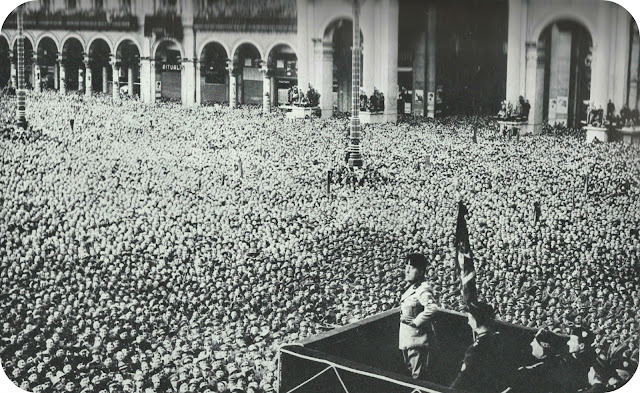 Tight-packed as poppy seeds, Italians jam Milan's cathedral square to hear their leader. 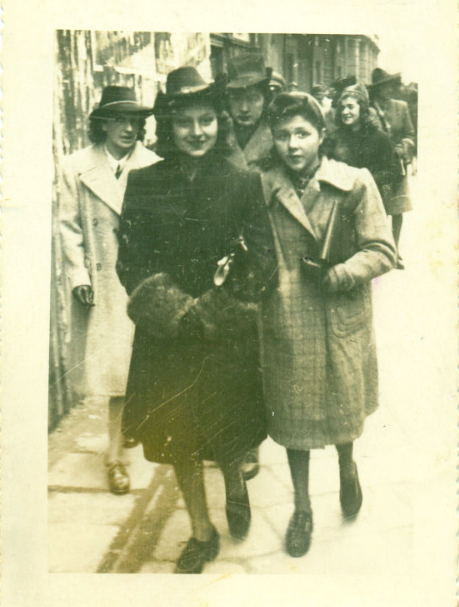 Finally, I just adore this 1940s 'lovers' postcard. Check out her dress and her hair! I look forward to exploring this year in other locations. 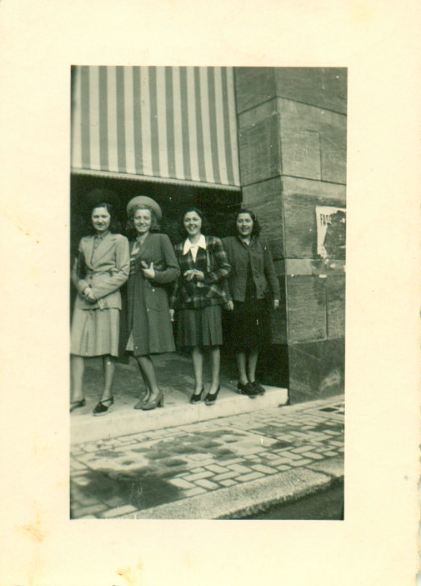 It's an interesting year to focus on for fashion since it's in the beginning of WWII. 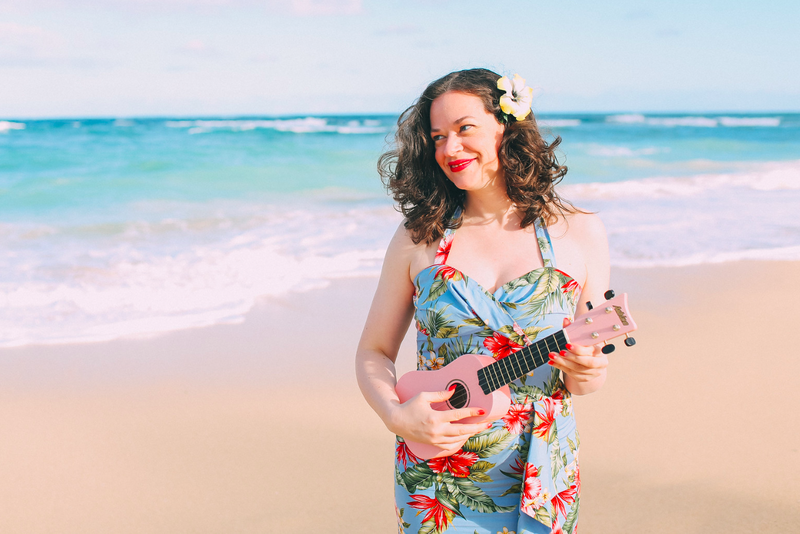 My goal is to showcase as many different types of source material as possible from the year – from newspapers to fashion magazines to other popular media.